Since 2006, Temple Beth Hillel-Beth El’s Men’s Club, Sisterhood and Israel Action Committee have jointly organized candidate forums to provide the community an opportunity to discuss issues with our Congressman and his challengers during each Congressional election. This year we welcome the four Democratic candidates and one Republican candidate vying in the primary for Pennsylvania’s 2nd Congressional District. 7:00-7:30: Dwight Evans (D) – Pennsylvania State Representative, 203rd district (Philadelphia), since 1980. 7:35-8:05: Chaka Fattah (D) – Congressman, 2nd district (Philadelphia, Lower Merion, Narberth), since 1995. 8:10-8:40: Brian Gordon (D) – Lower Merion Township Commissioner, 12th ward (Merion), since 2008. Please come and engage the candidates on the issues. Fattah (right) with Dr. Rafi Gidron, leading Israeli entrepreneur and founder of Israel Brain Technologies. Photo by Chen Galilee. Congressman Chaka Fattah (PA-02) joined leaders of brain initiatives around the world in Israel and stressed the need for more international collaboration as a means of making significant progress in developing new technologies and tools to explore and repair the human brain. Fifty million Americans have dementia and other brain illnesses. To gather together the minds that exist and see how we can tackle these ailments together, that is the work that is in front of us; to have a map of the human brain, an understanding of the roadways and an understanding of the traffic on the roadways. The remarks came during the panel, “Global Meeting of the Minds: Brain Initiatives Around the World,” featuring Congressman Fattah and leaders from respective brain projects in the European Union, the United Kingdom, Israel and Canada. The Israel visit and panel discussion are an extension of the Congressman’s continued efforts through the Fattah Neuroscience Initiative to build more partnerships between the U.S. BRAIN Initiative and other major brain initiatives around the world. Also addressing the first day of the conference were Israel’s fomer president, Shimon Peres, Pulitzer Prize-winning author and autism activist Ron Suskind, and the chief scientist of the Ministry of Economy in Israel, Avi Hasson. Fattah and Gidron with Israel’s former president, Shimon Peres. 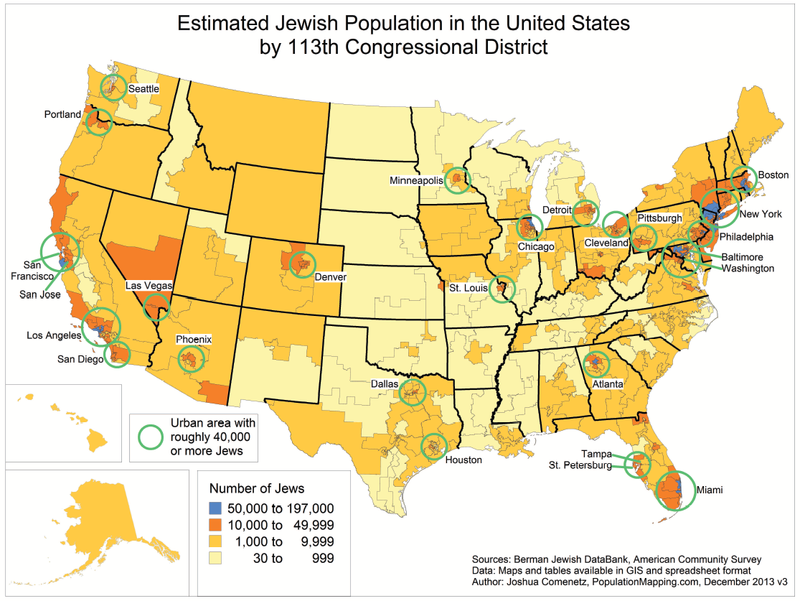 Joshua Comenetz has broken down the American Jewish population by Congressional district. The estimate of the Jewish population in all Congressional Districts is 6,735,830, approximately 2.18% of the total U.S. population. This estimate is consistent with the 6.7 million Jewish persons reported in the 2013 Pew Research Center Portrait of Jewish Americans…. The American Jewish population is simultaneously more densely clustered geographically than the overall American population and very geographically diverse — at least a few Jews live in every one of the 436 CDs. Half of all American Jews live in just 37 CDs, and 93 CDs contain three-quarters of all Jews. In contrast, the 266 districts with the fewest Jews collectively have only 10% of the Jewish population. The most-Jewish district, New York’s 10th, has as many Jews (197,000) as the 170 least-Jewish CDs combined. There are 13 CDs with 100,000 or more Jews, nine in New York and two each in California and Florida — the three states with the highest total Jewish populations. In general, the most-Jewish CDs are in the northeastern states, California, Florida, and a few other large urban areas such as Chicago and Atlanta. The least-Jewish CDs are mostly in the rural parts of southern states. Pennsylvania’s 13th Congressional District has the most Jews in the state and is ranked 24th nationally while the 3rd, 5th and 9th District have only 1000 Jews. Where is the Jewish vote the most decisive? Illinois’ 10th Congressional District whose 76,500 Jews (10.73% of the population) is about 23 times the 3,326 vote margin by which Democratic challenger Brad Schneider defeated Republican incumbent Robert Dold. Florida’s 32th Congressional District whose 32,000 Jews (4.60% of the population) is about 17 times the 1,904 vote margin by which Democratic challenger Patrick Murphy defeated Republican incumbent Allen West. New York’s 11th Congressional District whose 129,000 Jews (17.97% of the population) is about 12 times the 10,688 vote margin by which Republican incumbent Michael Grimm defeated Democratic challenger Mark Murphy. Runners up are NY-9 (6.95x), AZ-2 (6.93x), MA-6 (6.12x), NY-18 (5.19x), CA-52 (5.08x), NY-3 (3.45x), CT-5 (3.35x), CO-6 (3.29x), UT-4 (3.26x), CA-26 (3.03x), NY-1 (2.95x), FL-22 (2.73x), NY-6 (2.03x) and IL-13 (2.00x). Top: Republicans control 13 of Pennsylvania’s 18 Congressional Districts. Bottom: Alternative map, drawn by State Senator Daylin Leach, gives Democrats control of 13 districts. As a democracy, we are proud of our electoral system: We assume that citizens, through their vote, wield the ultimate power over our government and determine who shall represent them. However, this is not the case in reality. Rather, legislatures, through their redistricting authority, draw electoral maps specifically engineered to re-elect themselves and their colleagues. In 2012, the majority of Pennsylvanians (50.24%) voted for Democratic candidates for Congress while 48.74% who voted for Republicans, and 1.02% who voted for other candidates. However, Democratic candidates prevailed in only five of the 18 congressional districts: Bob Brady and Chaka Fattah in Philadelphia, Mike Doyle in Pittsburgh, Allyson Schwartz in the Philadelphia suburbs, and Matt Cartwright in northeastern Pennsylvania. Was this simply a matter of luck? The district map was designed to pack as many democrats as possible into these five districts. Fattah, for example cruised to victory with 89.28% of the votes, versus 9.37% for Robert Mansfield and 1.35% for James Foster. By forcing the Democratic voters to “waste” votes in districts where they are a super-majority, the Republican politicians are able to construct 13 districts with sensible Republican majorities. Conversely, Democratic seats in other Democratic strongholds such as Harrisburg and the Pittsburgh suburbs were prevented by cracking those areas into pieces and diluting them with outlying areas that lean Republican. In other words, voters do not choose the representatives who share their values; rather, the legislators wielding their pens choose the constituents whose support they can count on in the voting booth. The rest of the article, and TED Talk by State Sen. Daylin Leach, follow the jump. Since the redistricting process was controlled by Pennsylvania’s Republican governor, Tom Corbett, and the Republican majorities in the state House, State Senate and Legislative Reapportionment Commission, it is not surprising that the results are skewed in favor of the Republicans as far as mathematically and legally possible. To illustrate how easily the results can be skewed in the opposite direction, Pennsylvania State Senator Daylin Leach drew a map, which shows Democratic majorities in 13 congressional districts, and Republican majorities in the remaining five districts. In other words, if the map had been different, the congressional election could have been completely reversed — 13-5 instead of 5-13 — without a single Pennsylvanian changing his vote. What a farce our elections have become! In fact, one could draw an even more skewed map, with more homogeneous districts, giving Democrats small majorities in every single district, and leaving the Republicans with no representation at all. Could it be argued that the Republican-skewed map was dictated by the rules and the demographics, rather than by political interests? Both Leach’s map and the actual map feature contiguous districts almost equal in population. However, Leach’s map has more “compact” districts, whereas the actual map has districts which meander across the state in search of pockets of Democrats or Republicans as the case may be. Furthermore, the Pennsylvania State Constitution requires legislative districts to avoid splitting counties, cities, towns, boroughs, townships and wards “unless absolutely necessary.” Some splitting is necessary, because Philadelphia is too large to fit inside single district. However, Leach’s map has three fewer splits than the map adopted by the state assembly. Our state’s congressional delegation should be truly representative of the makeup of our state, and the Pennsylvania State Constitution should be amended to enshrine this principle into law. This coming week the Census Bureau will be releasing detailed data required for the redistricting of Arizona, California, Connecticut, Idaho, Pennsylvania, and Washington. In Pennsylvania, the Republicans control all the levers of power; they control the Pennsylvania House of Representative 112-91 and the Pennsylvania Senate 30-20 while Republican Tom Corbett is Governor. According to Keegan Gibson at PoliticsPA, “the Republican delegation is coming to Harrisburg” today to plan the redistricting which will change this district map and shape the elections over the next 10 years. Republicans are eying the possibility of matching up two of PA’s most powerful Democrats in a fratricidal showdown. Allyson Schwartz has millions of campaign dollars and the support of the white collar liberals of the Philly suburbs. Her district currently abuts that of Chaka Fattah, the most liked public figure in Philadelphia. It’s unlikely either would be willing to budge from their seat if their districts were combined, and that would mean a knock-down, drag-out fight between the liberal white Democrats of the suburbs and the African-American Democrats of Philly. What Republican wouldn’t love to see that? GOP plans to secure their districts will come as good news to some Democrats, who’s districts are likely to absorb the Democrats that Republicans don’t want. Some of those winners include (as of the current plans): Rep. Mark Critz, Rep. Tim Holden, and Rep. Mike Doyle. Each of their districts is likely to get more blue. 2010 Census Details about Pennsylvania and other states are available after the jump courtesy of the Census Bureau as they become available.